Our Automatic Tote Stackers / De-Stackers are compact and able to feed in stacks of totes bins. It can separate and release single totes bins when requested and has an infinite number of applications which can be applied in a range of industries from supermarket warehousing to the building material manufacturing industry. Stacks or unstacks blocks of tote bins into a single line. Able to operate at a rate of one single tote every 5 seconds. The solution can easily be integrated into existing lines. A fully-automatic and low-maintenance solution. You can also view the video on this page to see the simple yet effective and dependable system in action. We are one of the UK’s leading providers of tote stackers /destackers systems and also provide solutions for leading brands overseas. The system is built to the highest standard and can be found in warehouses and factories across the UK. You can contact us at any point if you do have any questions about how the system can work for you. The system can be used to stack a wide range of items including pallets, tires, racks, containers and more. We are able to provide stackers in various shapes and sizes. Stackers feature magazines which hold stackers as they are built up alongside an in-feed conveyor and lifting actuators. They also consist of forks or clamps to move your stack. We can provide facilities to stack varying heights of loads. Stackers and destackers are used by companies from various industries, including the automotive sector, in warehousing and in many other environments where containers are stored. At Asmech, we have been supplying tote stacker and destackers to businesses from various industries for many years. We are able to tailor your solution in line with your specific needs and can provide a system that will support your operations for years to come. We were first established way back in 1995 when we specialised in producing tailored conveyor and handling systems for companies working in the dairy and blow moulding sectors. We design, engineer, manufacture, install and service all the products in our range and are highly regarded for the standard of our aftercare support. We are always on hand to help you prolong the life of your system and promptly resolve any issues that might occur. 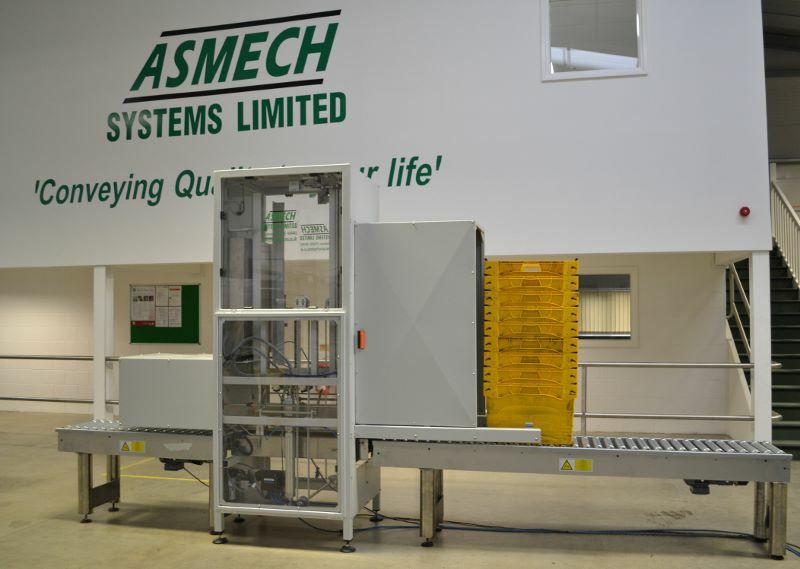 Other products supplied by Asmech include loop invertors, elevators and bottle palletisers to give just a few examples. We provide a host of bespoke solutions for lifting, turning, raising, lowering, rotating, stacking and destacking. Whether you require a small conveyor or a complete turnkey system, we can provide the first-class solution that you deserve at the right price. To find out more, simply call (01623) 424 442 or send an email to sales@asmechsystems.co.uk.